This blog lives for comments, so it is very disappointing when one pops up that looks promising and turns out to be a fake—some pleasant-sounding gibberish sent out at random by evil agents of Viagra. They probably think that I will be so flattered by the compliment that I will go ahead and post the comment even though it clearly has nothing to with me. Hi, this website delivered in a google listing on Diamond jewelry, it was more or less exactly what I expected but seeing your article I’m pleased it did. Maintain the excellent work! 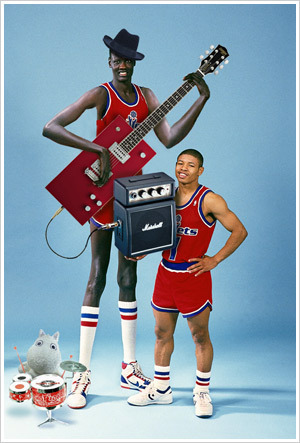 How much do I love this photo of Manute Bol and Muggsy Bogues? This much! I was deeply saddened to learn of the death this weekend of Manute Bol, the 7-foot-7 Dinka from Sudan who, among many other adventures on planet Earth, played 10 seasons in the NBA. 3 of those seasons were for My Golden State Warriors, and it was then and future Warriors coach Don Nelson who had the genius idea of keeping Manute from clogging the lane on the offensive end by encouraging him to shoot 3-pointers. Once in a while one of them would go in, and I remember watching one particular game where he hit a bunch of them. The crowd went wild, of course. There are lots of great Manute stories…how he killed a lion with a spear…how his landlord once complained to Nelson because he was cooking in the fireplace rather than the kitchen of his Oakland apartment…how he may have coined the phrase “my bad.” But he also suffered a lot in this world. After retiring from basketball he more or less gave all his money away and ended up a destitute political refugee. He got involved in cheap stunts like being a jockey for a day and fighting William “The Refrigerator” Perry on Celebrity Boxing. Later he was involved in a serious car accident that nearly killed him, and contracted a rare and exotic skin disease that finally did. The remarkable lack of scoring should come as no surprise, but despite my resolution to be all serene and grown-up about it…well, this morning I was watching the Netherlands team play a very skillful version of the strategic game, much of which involves going backward to go forward, and found myself thinking of all the other things I might be doing at that moment. Which were few, honestly, because it was 5 o’clock in the AM. I spent a few minutes working on my as-yet-half-developed theory that part of the reason Americans don’t like soccer is that, in contrast to many of the games we play, it mirrors real life in that scoring is relatively rare and thus to be celebrated with great fanfare. That doesn’t take into account basketball, though, and I think that fully fleshing out this theory will require a substantial grant from the relevant authorities. German police said on Monday that after making his getaway from the Hell’s Angels club, the 26-year-old dumped the bulldozer, causing a 5 km (3 miles) traffic jam near the southern town of Allershausen, local police said. He then fled to his home nearby where he was apprehended by the police. “What motivated him to throw a puppy at the Hell’s Angels is currently unclear,” said a spokesman for local police, adding that the student had lately been suffering from depression. The puppy was now in safe hands, the spokesman added. The best line is “What motivated him to throw a puppy at the Hell’s Angels is currently unclear.” So marvelously deadpan, and if you imagine it being said with a German accent, it’s even better. BERLIN (Reuters) – A German student created a major traffic jam in Bavaria after making a rude gesture at a group of Hell’s Angels motorcycle gang members, hurling a puppy at them and then escaping on a stolen bulldozer. In the course of conducting my (perfectly innocent, I swear) affairs today, I happened to come across the Web site for something called the “World Toilet Organization.” I am not making this up and as far as I can tell it is a real thing, either that or a very elaborate and staggeringly deadpan hoax. As a favor to me I’d like for you to peruse their site, read about World Toilet College, World Toilet Day, and the World Toilet Summit, and let me know via comment which you think it is. Your assistance is appreciated. Over the first couple of days the 2010 World Cup has stubbornly resisted my determination to stay interested in it. It started off well enough, with a game between South Africa and Mexico that ended in an unsatisfying 1-1 draw, but had in its favor the novelty, pomp, and circumstance of being an opening game featuring the host country. That game was quickly followed, however, by a remarkably tedious contest between France and Uruguay that ended in a scoreless tie. 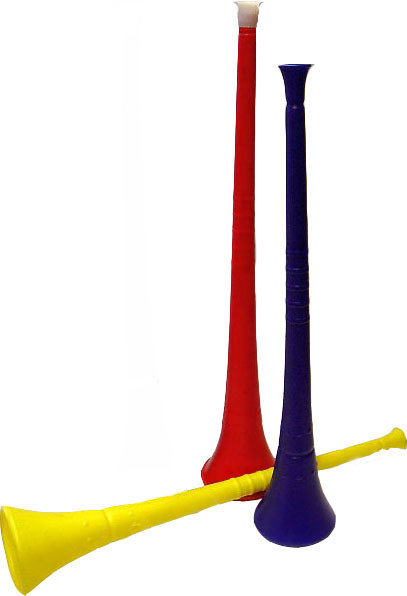 During the slow stretches of this game, of which there were many, there was nothing to occupy your attention except the remorseless droning of the vuvuzelas—horns that sound like the frustrated buzzing of a million bees just angry enough to make a commotion but not angry enough to do anything about it—which are apparently going to be ubiquitous at this year’s tournament. They ought to be stopped but probably won’t be, because they are “part of the culture” and no one wants to be the cause of any further unpleasantness in South Africa. This morning we got the first match with an actual victor (South Korea) and loser (Greece, looking every bit as dreadful as their economy). Then an Argentina and Nigeria matchup that had only one goal, but looked fast-paced and at least boasted the spectacle of Diego Maradona stalking the sidelines like a friendly bear in a suit. A perfect example of why soccer will never be a major sport in the US. Here in the US we want winners and losers dammit! On tap for tomorrow: Algeria vs. Slovenia, Serbia vs. Ghana, and Germany vs. Australia. Oh, and a little thing called Game 5 of the NBA Finals, or the Massachusetts Republic vs. the Emirate of Southern California, if you prefer. Great opportunity for a long summer day of total assal horizontology. Go Celtics! Go Ghana! Go Slovenia! Hell, go everybody—except you, Kobe. I have to draw the line somewhere. With the World Cup set to start tomorrow, I recommend that you take a minute to review my list of World Cup Dos and Don’ts. Though written in 2002, they are every bit as relevant to to this year’s tournament.